Discussion in 'Downhill & Freeride' started by Downhiller, Dec 14, 2005.
and frame looks like half RM and other half azonic..
No I dont think it is necessary at all......and the bike looks odd (IMO). Looks like a turner did it with foes mono while jamis cheered them on and shouted instructions. Looks like some terrible standover goin on there. Looks like a RM rear ended a Trek Deisel. 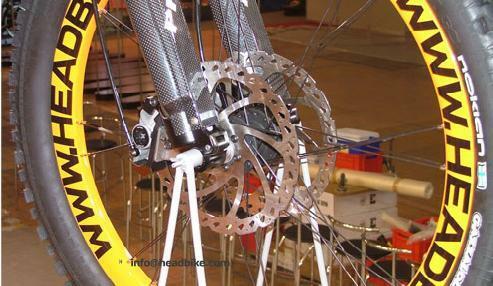 which fork is that with two things for brakes on each side ? The dual rotors have to be some kind of marketing ploy to turn heads while on display. Looks kinda cool, but I'd be inclined to take a cutting torch to that TT and mount that nut-crusher a bit lower. I remember seeing a two-rotor mount 20mm hub somewhere before. I checked their Website, and found something very disturbing...this is their best looking bike. That thing says Euro all over it.